Top UK shares have edged lower, after a number of trading statements from retailers indicated consumer demand was slowing. Investors' increasing worries over a slowdown in High Street spending clouded strong sales from British retail icon Marks & Spencer. M&S saw its shares fall 18 pence to 304p in spite of strong sales growth over the crucial Christmas period. The retailer said that on a like-for-like basis - which strips out the effects of store openings and closings - total sales grew by 7% in the 15 weeks to 11 January. Food sales were up 4%, and non-food sales grew 8.8%. "We had a good Christmas, building on our strong performance last year," said chief executive Roger Holmes. High Street chain Woolworths said it had a "satisfactory" Christmas after it recorded a modest rise in sales. In the six weeks to 11 January, like-for-like sales grew by 1.5%, and increased by 1.2% over the half-year. Woolworths took on thousands of extra staff and hundreds of additional cash tills in order to meet demand over the crucial Christmas and New Year trading period. The company added that it anticipated a "significant" improvement in profitability this year, which would be in line with market expectations. Investors liked the news - shares in the retailer surged 13% initially, before falling back slightly to close at 34.25p, up nearly 7% on Tuesday. The festive period meant good news for Britain's most famous toy store, Hamleys. Its like-for-like sales rose 6.1% in the five weeks running up to 28 December, while like-for-like sales in the second half of its financial year were up 11.3%. But British restaurant chain Pizza Express, under pressure from a number of takeover approaches, continues to struggle. It said its like-for-like sales were 5.1% lower in the 14 weeks to 29 December. "The trading environment remains difficult and our biggest challenge continues to be disappointing trading at our core Pizza Express restaurants particularly within London," the group said. Christmas has also been less than kind to budget clothing retailer Matalan as its shares fell 6% to 195p, before rallying slightly to close at 202p, after it announced sales rose just 1% over the festive period. Matalan, which is based in Skelmersdale, west Lancashire, and has more than 150 stores, said that, for the five weeks to 11 January, like-for-like sales rose 1% compared with 13.1% in the previous year. But chief executive Paul Mason said: "Given the difficult market conditions experienced in the run-up to Christmas, Matalan continues to deliver good top line sales growth at healthy gross margins." Rhys Williams, analyst at Seymour Pierce, said: "The sales were weaker than expected - 1% isn't that good a performance." Shares in clothing retailer Austin Reed took a 10% tumble to 95p, before rallying to close just half a point down at 105p, after the company issued a profit warning. The men and womenswear group, which was founded in 1900 and has more than 50 shops in the UK, said like-for-like sales slipped 2.3% for the five weeks ending 11 January. "As a consequence of slow sales over the key Christmas period, we now anticipate that profit before tax for the year ended 25 January will be moderately below expectations," the company said. Following the update, analysts at Seymour Pierce cut their forecasts for pre-tax profits to �7.4m, from �8.1m. Business was not much better for John David Group. After a gloomy Christmas it issued a profit warning, which sent its shares tumbling to close 21% down at 191p. Like-for-like sales at John David's JD Sports Division were down 1.36% and slipped 2.03% at its First Sport division in the six weeks to 11 January. The UK's largest sporting goods retailer JJB Sports reported a slight rise in Christmas sales but said margins fell because consumers only really began buying when it cut prices. But chairman David Whelan said full-year profit would be in line with expectations. JJB shares closed 4.4% down at 141p. The sports goods retailer said there was a continuing trend for consumers to try to force price cuts by delaying purchases until close to Christmas. "Trade was therefore comparatively stronger in the last few days before Christmas and at the start of the New Year sales," said Mr Whelan, adding discounts had cleared autumn/winter lines. JJB's like-for-like sales, excluding the TJ Hughes discount retailing business JJB bought for �42m last March, rose 0.5% in the six weeks to 5 January. Like-for-like sales at TJ Hughes were up 3.4% in the period, whereas total JJB store sales were 3.8% higher in the 23 weeks to 5 January. 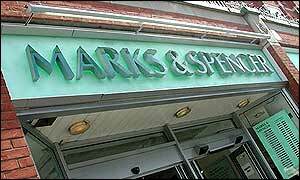 What now for Marks & Spencer?